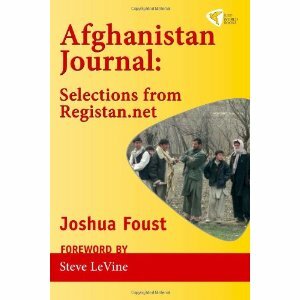 Joshua Foust's new book is a collection of blog posts from Registan.net written during his time working as an advisor to the US Army. It takes an analytical and sometimes passionate look at the policy and strategy failures of the military and identifies why NATO is not winning this war. Joshua Foust’s “Afghanistan Journal: Selections from Registan .net” is a collection of his blog posts on Registan.net while he was on a tour of duty in Afghanistan (intermittently between 2006-2010) as part of the US Army’s Human Terrain System – a group that aims to make individual soldiers “culturally literate” and aware of their social environment. The idea being that they can hold the field after the battle only if they have convinced the locals of their good intentions and their understanding and respect for their culture. It sounds like an institutionalised “Hearts and Minds” division. It is a fascinating read, a bit like a fly on the wall in the camp canteen along with an incisive analysis of what is going wrong, in answer to the now insistent question, “why is NATO losing the war?”. Foust is a military analyst specialising in Central Asia. He brings a civilian approach and human logic to military affairs in an attempt to make it clear that Afghanistan is a complex and multi-layered reality that cannot be understood with the lazy “us and them approach” so often being touted in the international media and by regional experts. He pulls no punches, he is highly critical of the military in its semi-paralysis and its reliance on just being present in Afghanistan and its abandonment of all consistent policy and strategy. Just being there and biding time is not enough. You cannot operate in a cultural and social vacuum. Foust’s book is a mixture, part travelogue/part memoir. It is an intelligent mix that makes for good reading. You can almost see Foust developing over the years, he starts out in a slightly Hunter Thompson vein as he scours the graffiti in the latrines in a the US army base in Kuwait looking for clues but as the book rolls on he becomes more serious and focused – he sees the aims of the war as just but the execution as a disaster. However, you can see that hanging around with the army for months on end is rubbing off on him as he assimilates the army’s drive and frustrations. Foust starts out at Camp Bagram and then travels to various FOBs (Forward Operating Bases) – not getting the chance to stray much beyond camp life as he himself complains. His job is supposedly to mingle and communicate with local Afghans and impart his findings to those fighting there, to make their work more effective, but just getting his job done is not simple. There are obstacles (security issues) to getting his job done. Kabul he finds a bit surreal, cooped up as he is on the base and he quickly realises that Kabul is a bit like being in New York, special but not by any means the USA. He wants to push on into “real” Afghanistan. Foust’s book gets rave reviews from people who should know what they are talking about: Ronald Neumann , the US Ambassador to Afghanistan from 2005-07 and the Pakistan expert Anatol Lieven. The whole issue of what makes an Afghan expert is difficult. Judging from Foust’s criticisms of other analysts and journalists it is far too easy to become an Afghanistan “expert” you just need to read a couple of books on the Russian debacle and a couple more on the British wars in the 19th century and you are already in to the top 5% of “informed” commentators – which does not say much for the rest of us. The US and NATO forces went into Afghanistan totally blind with never a thought to reading some commentaries and analyses by the Russian and British who failed miserably at the same task before them. The eternal refrain of the deluded “It is different this time” which originated in Wall Street has now foolishly been adopted by military strategists. There is clearly hubris at work, fuelled by the overwhelming bombing power of the US Air Force but stymied by the under-whelming lack of willpower of the US Army to get the job done. Motivation is clearly a problem. Nobody can answer the question of “What the hell are we doing here?”. They can however answer the question of “Are we winning?” with a resounding no. Risk aversion in the military has become one of the key issues. It is clear that the US contingent is so risk averse that it has got to the point that officers who lose a soldier under their command are subjected to gruelling investigations. Having a death reported in the papers appears to be the cardinal sin – not losing a fire-fight. Best to do nothing and keep your slate clean. In private conversation Foust notes that the solution has to be a more vigorous and risky approach to the war – and there are officers who agree with him. NATO forces have to get out “beyond the wire” and get shot at (and shoot back). There are too many battles being won that are immediately lost by the inability to consolidate the victory with the locals. The Taliban are far more vicious and the locals know it. The US might build you a road and a school but the Taliban will come down from the hills and kill your family if it looks like you are getting too cosy with NATO. In that sense it is an unequal fight, the NATO forces are too wary to stick their collective head out of the trenches – risk aversion gone wild. Foust never really gets to grips with the big question of “Why are we here?” but he most certainly gets to grips with the question of “why aren’t we winning?”. The first line of the book lays it on the line, making it clear that 9/11 originated in Afghanistan thus making the invasion of Afghanistan a non-discussion point. It looks like Foust’s patriotism may curb his thinking on this issue as he jumps straight to the issue of strategy and sidesteps the issue of the 9/11 hijackers all coming from Saudi Arabia and Yemen, albeit possibly bankrolled by a Saudi in an Afghan cave. Morality is not Foust’s beef, he has an issue with military incompetence. There is no will to fight, policy is shambolic and strategy is hopelessly short-sighted. And to make matters worse the cardinal rule of counterinsurgency operations is being continually broken. You have to get in on the ground and get to know the people you are trying to liberate. 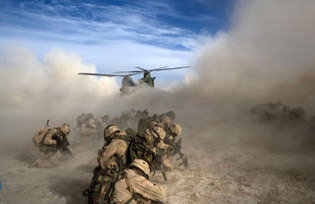 It is pointless sweeping in and chasing out the Taliban and then leaving the field so that the Taliban can filter back in over the following weeks. NATO operations as described in the book resemble the labours of Sisyphus. Local leaders make it quite plain to the US army that it needs to do simple things, build a mosque, finance some irrigation projects, to convince the local Afghans that the US is not anti-Islam. It would be simple but effective. When a US soldier bursts into the women’s quarters wreaking havoc during a house-to-house search it merely authenticates all the Taliban propaganda. How simple can it get? There are too many officers and too few grunts willing to get the job done (he notes the exception of the Canadians who seem a much more effective fighting force). It looks like there are soldiers who never set foot outside the base unless it is en masse and heavily armed – and the idea of engaging with the locals on a human level as anathema. Foust has to make a concerted effort to get himself “outside the wire” and meet with the locals and get his point across and above all learn about what is going on. Afghanistan is complex and all Foust’s self confessed maniacal reading over the years have helped but meeting the locals face to face opens his eyes to just what is going wrong in the Afghan campaign – the US army comes across as bungling, unthinking, without motivation and ill-informed despite what pass for good intentions. Foust takes on the opium issue too and sees it as a distraction. Certain elements of the military see the fight against the opium trade as vital, seeing the trade as how the Taliban finance their operations. However, wiser heads advocate letting local farmers grow their opium since denying them their livelihood would be political suicide for the NATO forces – it is best to view the opium issue as a mere sideshow. It is a complicated and interesting issue that Foust looks at in detail. Foust also takes a look at Afghanistan’s neighbours and touches on potential Chinese, and Iranian interference and a possible “spill-over” into the “Stans” but Pakistan, as ever, is the key as Afghanistan is the geographical area that gives Pakistan “strategic depth” in its eternal conflict with India. India hovers over this Afghan conflict like a malevolent spirit. There is a patriotism in his writing that seeps through as do the occasional flights of poetic fancy as Foust is overwhelmed by the sheer beauty of Afghanistan as a country, it is clearly a place that gets under your skin. Foust’s patriotic heart wants the military to succeed but his analytical brain is telling him the war is going to be an abject failure. He is in an uncomfortable position, having to educate people on the complexities and delights of Afghan culture just before they step out of the chopper and start killing them. He takes his job seriously though and sees the inherent contradictions in his work- a poet amongst grunts but he soldiers on and obsessively tried to identify what is really going on. He has a professional spirit which keeps him going. The book is not an uplifting read. It demonstrates that after nearly ten years NATO has accomplished basically nothing in Afghanistan and will be obliged to pull out in the most dignified way that it can to save face. Foust highlights a truism, that the Army thinks along army lines, it has a rigid unimaginative approach. It is a bit like the Russian joke about every time a Russian tries to design a car it always ends up looking like a tank. The same applies to the US Army which has a big hammer so it sees nails everywhere – just don’t show the Army any screws. After the initial bombing by the Air Force the Army comes in to clear up but is clearly incapable of doing so. Take the Air Force out of the equation and you have a very sorry picture. In the long term, the war looks like a hopeless case. The Taliban seem willing to be Confucian about the whole business and sit by the river until the body of their enemy floats by. They know that they will always be in Afghanistan but the US will eventually leave, it is only a matter of time. Foust takes a look at his other researcher/analyst colleagues and mainstream journalists covering the Afghan conflict and he is often harsh. There is clearly a lot of rivalry in this small area of Afghan central Asian specialists and you can see claws being sharpened over strategic nuances that are clearly unnecessary. But a certain amount of bitchiness can sometimes be necessary. The blog format is interesting but eventually frustrating. For example, Foust highlights important differences between different insurgent forces the Hizb-i Islami Gulbuddin and the Jamiat-i islami, the Afghan Taliban, the Pakistan Taliban, Al Qaeda in Afghanistan and just plain Afghanis. They are by no means all the same and identifying the enemy and leveraging difference between these groups appears to be the key job that has barely begun. There is no room for a full analysis – hopefully in his next book. Afghanistan Journal is very well written, Foust has an engaging style and makes you yearn for more detail. It really should be required reading. It is totally devoid of clichés and propaganda. At best Foust’s work is a fundamental part of military strategy, helping to consolidate military gains and at worst just the sending of a poet amongst a bunch of grunts to raise their IQ by a tad – just before they go off and shoot a bunch of Afghanis without any clear idea why. Your enjoyment of the book will all depend on your level of cynicism and what side of the political fence you are on but there is no arguing with the fact that we desperately need more of this kind of analysis. And that is just Foust’s point. Joshua Foust, is a military analyst specializing in Afghanistan, Pakistan, and post-Soviet Central Asia. His writing, which covers military affairs, geopolitics, and strategic energy issues, has appeared in the New York Times, Reuters, the Christian Science Monitor, World Politics Review, and the Columbia Journalism Review. He blogs at Registan.net and is a regular contributor to PBS Need to Know and a contributing editor at Current Intelligence, a journal of opinion and analysis.